Planning for a family bonding this weekend? 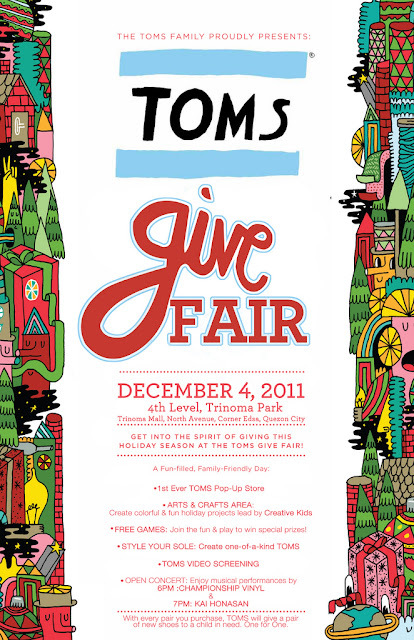 Bring your kids in a fun-filled, family friendly day on Sunday, December 4, 2011 at TOMS Give Fair, Trinoma Park in Quezon City. Enjoy pleasurable activities, join the fun to win special prizes too! Definitely, you and your kids will love the enjoyable event. At the same time you can do some Holiday shopping at the first-ever TOMS Pop-Store in the country and, treat yourself to all the wonderful activities TOMS has lined up for you to enjoy a fun-filled family friendly day. It's their way of saying thank you and getting everyone into the Holiday Giving Spirit. Give Joy, Give TOMS. See you there! kung malapit lang kami sa Trinoma we would go. sana magkaroon sa mas malapit sa min.